Preheat oven to 400. Heat olive oil in a skillet. Finely dice onions and sauté with garlic in skillet until softened. Thinly slice the veggies. Spray 8×8 pan or round baking dish with non-stick spray. Spread softened onion and garlic in the bottom of the dish. 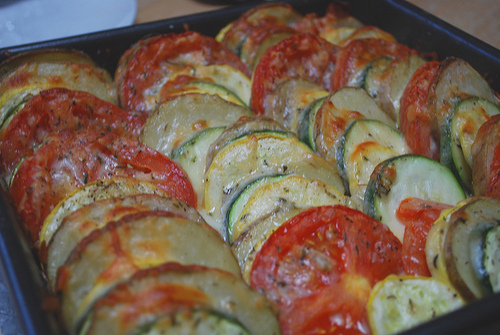 Line up thinly sliced veggies alternating them vertically in the pan. Sprinkle with salt, pepper and thyme (thyme optional!) Cover with foil and place in oven to bake for 30 minutes. Remove the foil, top with cheese and bake for another 15-20 minutes or until cheese is golden brown. Interested in more articles about frugal fitness and food?